We’re busy marketing our packages over next 6 weeks and intend starting our first Caminos from the end of May, 2017. If you have any queries, feel free to contact us and we’ll be happy to clarify. Since we launched, there has been serious amount of interest in our packages and we cannot wait to get started on our ramblings up the Waterford Greenway and beyond. Elaine and myself have been overwhelmed by the encouragement we have received to date. For anyone starting out in business, it can be scary just as much as it can be exciting and we genuinely appreciate your support as we take our first tentative steps down the Camino trail. With good people around us we know we will not be alone wherever our path leads us. Thought it would be best to leave our first blog to someone who attended our launch on Saturday last, 8th of April in Waterford’s Medieval Museum. Thanks to Kieran Walsh, Munster Express, for the review of the launch and to Noel Browne for the photos. A new era of tourism in Waterford City and County was heralded at the launch of Waterford Camino Tours in Waterford’s medieval museum on Saturday last. 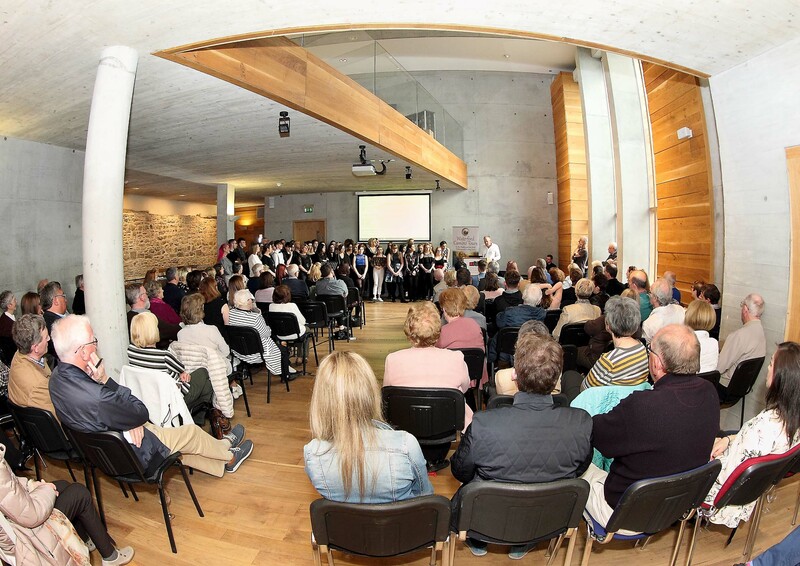 Almost 200 people turned out to hear Phil Brennan and Elaine Harvey announce the ground-breaking tourism dynamic for Waterford that will encourage visitors to extend their ‘dwell time’, stay longer and enjoy the many unrivalled tourist attractions that Waterford now offers. It was a marvelous event of song and story and we were privileged to be there and the great singing was truly uplifting. 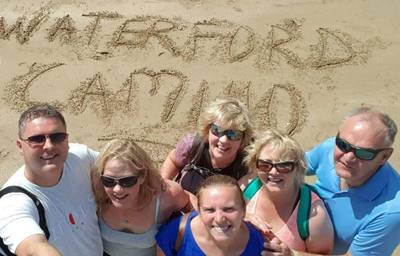 Waterford Camino Tours unveiled a very distinctive range of spiritual and sports packages to meet the requirements of an ever evolving domestic and international tourism market. 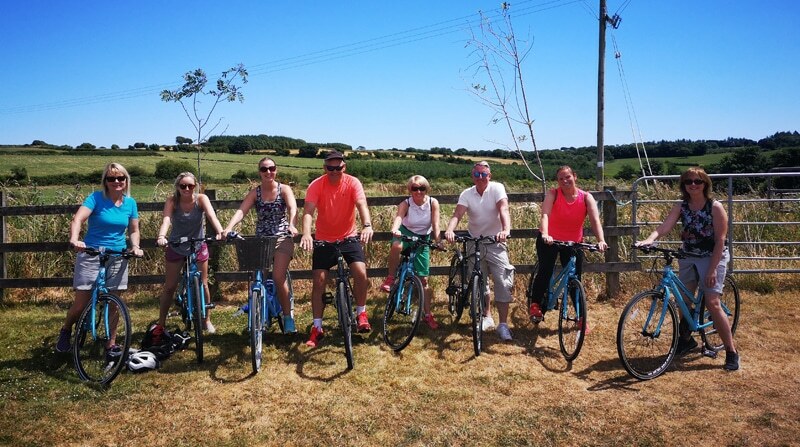 Their spiritual packages have the 4 star Athenaeum House Hotel in Ferrybank as their base and includes bike hire on the Greenway, bus transfers, guided walks with reflective ‘compass points’ to steer visitors on their journey each day. Phil and Elaine are well known in the city for their work with the Island of Ireland Peace Choir, and, more recently, with the High Hopes Choir. Phil has recently completed a PhD in Spirituality and he spoke passionately at the launch on the need to break new boundaries in the promotion of the spiritual in modern Ireland. “The Greenway and the beautiful trails that lead off it invite people to take ‘time-out’ from the often frantic pace of modern life and be inspired by the wonders of the natural world in their search for meaning and purpose”, Phil stated. Phil and Elaine have mapped out their own Waterford Camino with the Greenway as its spine and with many beautiful arteries that lead off it including Crough Woods, the Mahon Falls and Clonea Beach. Music at the launch was provided by the Island of Ireland Peace Choir, members of the High Hopes Choir and the Speakup Singout Choir from Dublin. Guest speaker included the Mayor of Waterford City and County Council, Cllr. Adam Wyse, John Halligan T.D. Minister of State for Training, Skills and Innovation, Sarah Fitzpatrick, Failte Ireland and Jacqui Gaule, Senior Enterprise Development Officer, LEO Waterford. 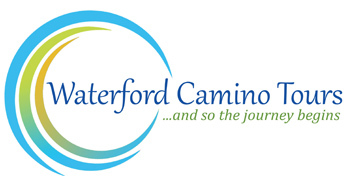 This new initiative was also welcomed by local businesses and other local tourism attractions who will partner with Waterford Camino Tours. Mailo Power mentioned that there was great energy in the room with the launch and a positive spirit as music artists and singers performed. Waterford, she said, had come from a dark space and now there has been positive news, there was mention of Mayor Rice doing the Camino in Spain, starting from the Waterford Treasures building, then to Passage East and to North Spain in late 1400s, the Rice connection with the C.B.S. is another at Mount Sion. Phil Brennan sees the whole idea evolving and unfolding. He thanked Janet Carey, Redsox Media, for her web design. Mayor Wyse praised the initiative and noted his great love of the Peace Choir over the years, Phil referred to his late, great dad Gary, who was so well liked and had fond memories of him. Interestingly, one of the singers in the choir Mousey has had his spiritual journey and has seen his life transformed from addiction problems in the past to a new positive life, stated Phil Brennan and he told the Munster Express of his new house coming up from Morrison’s Road. He got great applause when he was named and noted specially a recent singing performance visit to Belfast. Mousey says Phil is an inspiration for others. Phil describes singing as a type of creative therapy. Meditation will be done on the walks and at the Edmund Rice Centre, which will be involved, then on to the Greenway, which he said is a unique space and is the main focus. Bike option also with hired bikes. Other locations to feature on the new Camino will be the coastal areas of Dunmore to Portally Walk, Tramore Sandhills and the walk from the Deneraile to Newtown Cove, as their 3 and 5 Day Packages. This is in addition to the Mahon Valley, Crough Woods one. Bus picks for the people will be part of the plan which will start in June. Phil mentioned that a walk to the Sandhills one day gave him the inspiration to do the Waterford type Camino when he talked with Professor Michael Howlett and got some vision of what could be done. Another feature of the Greenway walks which will be the main attraction will be seeking nearby Holy Wells, of which there are many. Trial maps will also be available.